Ever wondered what labyrinths are all about? 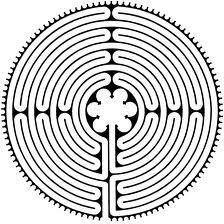 What kind of benefits they offer and/or walk a labyrinth and experience it’s benefits? How is it beneficial for those in care giving roles as well as those affected by various disabilities, chronic illness or disease? Labyrinths have a spiritual connection. Walking a labyrinth can quiet a caregivers mind and bring solace to individuals and is often used in health care and therapeutic environments.Labyrinth walking is among the simplest forms of focused walking meditation, and the demonstrated health benefits have led hundreds of hospitals, health care facilities, therapeutic approaches and spas to install labyrinths in recent years. 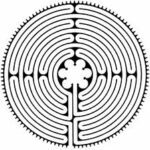 The labyrinth is an ancient spiritual tool that involves walking a path as it winds in a circular pattern toward the middle of the circle and then out again. In many ways the walk is a walking meditation, a symbolic pilgrimage, the journey being as important as the destination. Walking through a labyrinth creates a discovery of where you are, where you are going and the process that winds and unwinds as you walk on the path of life. The labyrinth is a place for you to open your mind, listen to your heart and heal your spirit. While there are no set rules, a typical walk involves three parts – walking in, spending time in the center, and walking back out. Return/Renewal – the path is re-walked, preparing to reenter the world and actualize the new sense of self, or knowledge gained in the labyrinth.